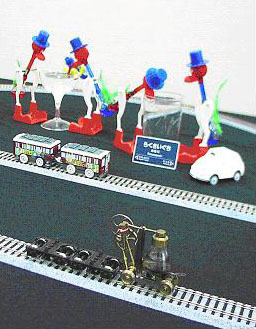 ﻿ "Ideas and imagination in Engineering - Engineering dreams in small toy pieces"
drinking birds and a mini steam locomotive. (Satellite 2) Heating was Easy, but Cooling was Difficult! a radiation thermometer/ you are emitting radiation!. a tube that cries when heated , a hello call by a thread phone and a singing cicada. (Satellite 4) You spin me right round baby! a steam river-boat and a mini-thermal power plant. Our drinking birds welcome you!